Biological diversity is maintained. The quality and occurrence of habitats and the distribution and abundance of species are in line with prevailing physiographic, geographic and climatic conditions. Non-indigenous species introduced by human activities are at levels that do not adversely alter the ecosystems. Populations of all commercially exploited fish and shellfish are within safe biological limits, exhibiting a population age and size distribution that is indicative of a healthy stock. All elements of the marine food webs, to the extent that they are known, occur at normal abundance and diversity and levels capable of ensuring the long-term abundance of the species and the retention of their full reproductive capacity. Human-induced eutrophication is minimised, especially adverse effects thereof, such as losses in biodiversity, ecosystem degradation, harmful algae blooms and oxygen deficiency in bottom waters. Sea-floor integrity is at a level that ensures that the structure and functions of the ecosystems are safeguarded and benthic ecosystems, in particular, are not adversely affected. Permanent alteration of hydrographical conditions does not adversely affect marine ecosystems. Contaminants in fish and other seafood for human consumption do not exceed levels established by Community legislation or other relevant standards. The MCC calendrier aims to provide an overview of meetings, conferences and events related to the MSFD, related policies and the marine sciences. Several pieces of environmental European legislation require the assessment and monitoring of specific components of the marine environment, with the ultimate aim of achieving and maintaining a good environmental status. Marine models can be useful for a number of purposes related to the Marine Strategy Framework Directive (MSFD), such as to determine baseline conditions from the past, estimate the future impact of pressures and the suitability of measures, complement scarce datasets and help prioritise sampling activities. 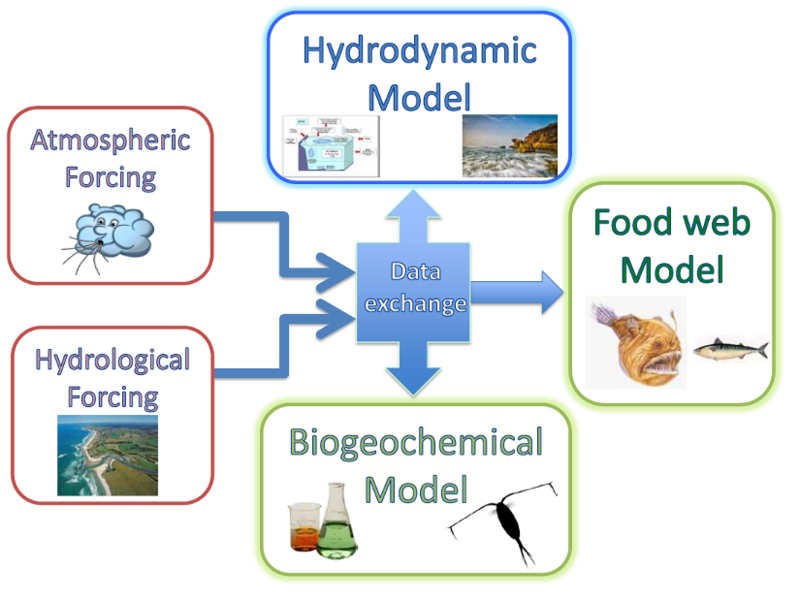 The modelling framework proposes end-to-end modelling which aims to represent large parts of the marine ecosystem by including the most relevant processes in the system, from physics to chemistry, and plankton to fish. This system is explicitly linked to the descriptors of the MSFD. higher-trophic-level food-web models (from phytoplankton to marine mammals/seabirds). The models considered will be aligned for comparison with policies, i.e. hydrological models with the Water Framework Directive (WFD), and higher-trophic-level food-web models with Biodiversity policies. Stips et al. (2015). Towards an integrated water modelling toolbox, JRC Technical Report. Stips et al. (2016). Scoping report on the potential impact of on-board desulphurisation on the water quality in SO2 Emission Control Areas, JRC Technical Report, EUR 27886 EN. Garcia-Gorriz et al. (2016). Inventory of models, basin configurations and datasets in JRC Marine Modelling Framework, JRC Technical Report, EUR 27885 EN. Stips et al. (2016). Alternative assessments of large scale Eutrophication using ecosystem simulations: hind-casting and scenario modelling, JRC Technical Report, EUR 27904 EN. The 'Kick-off workshop of the Network of Experts for ReDeveloping Models of the European Marine Environment. Eutrophication modelling and Descriptor 5 of the Marine Strategy Framework Directive' was held on 20-21 January 2016 in Brussels, Belgium, jointly organized by DG Environment and DG JRC (IES –Water Resources Unit). The workshop also served as the inception meeting of the newly created informal network of experts on the Modelling of the European Marine Environment (MEME). The participants were invited to join the network DG Environment and DG JRC emphasizing the added value of a joint effort to further develop modelling capabilities with the objective of providing useful advice for policy makers. This was well received by the attendants. The report summarises the workshop and provides further detail on the presentations, discussion and conclusions. Desmit X., Thieu V., Dulière V., Campuzano F., Garnier J., Gypens N., Pinto L., Lancelot C., Ramiro N., Menesguen A., Billen G. & Lacroix G.
How could state of the art ecosystem modelling support the HELCOM eutrophication assessment?